The Neuroscience Intensive Care Unit (Neuro ICU) at UT Southwestern is one of the world’s premier neurological diagnostic and treatment centers. Our 20-bed unit is equipped and designed to provide coordinated, compassionate care, while closely monitoring and treating patients with life-threatening neurological conditions. We understand that being in the hospital or having a loved one in the hospital can be frightening, and we want to make this time as comfortable as possible for you and your family. We have leadership coverage in the Neuro ICU 24 hours a day. If you feel you need to reach out, your go-to person is the charge nurse. 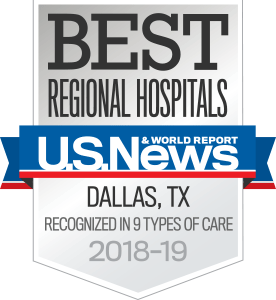 In addition to a clinic manager, this unit has five assistant managers and an incredible team of neurocritical care physicians and mid-level providers. Providing you with top-quality care is our No. 1 priority. The Neuro ICU, which is the largest in the region, is staffed 24 hours a day, seven days a week, with a team comprised of highly trained physicians, nurses, patient care technicians, respiratory therapists, and ancillary staff. We coordinate your care with specialists from pharmacy, radiology, nutrition, chaplain services, social work, and physical, occupational, and speech therapies. There are two medical teams that treat patients in the Neuro ICU: the Neurosurgery team and the Neurocritical Care team. You may receive care from one or both teams. The Neurosurgery team includes vascular, tumor, and spine specialists. We have board-certified neurosurgeons and five neuro-intensivists, who ensure patients receive the appropriate access to care to manage conditions ranging from stroke and aneurysm to brain tumors. The Neurocritical Care team offers specialized treatment for patients who are experiencing problems with one or more of their body systems, such as their heart, lung, or kidneys. Admission to the Neuroscience Intensive Care Unit (Neuro ICU) may be pre-planned, such as for patients who require close monitoring following surgery, or it may be unplanned following an aneurysm, a stroke, or deterioration of a condition. It can take around one to two hours to admit patients and settle them into the unit. Sedation is often given to ensure that patients are comfortable after surgery, while on the ventilator, or receiving other treatment. The Neuro ICU has open visitation, but to provide privacy during shift change, only one guest may remain in the patient’s room from 6 a.m. – 8 a.m. and 6 p.m. – 8 p.m.
No more than two visitors per patient are allowed at the bedside. There is patient information passed in hallways as well as in the nurses’ station, so in order to protect privacy per HIPAA, please remain in the patient room during your visit. Under some circumstances, we ask for limited visitation when it is in the best interest of the patient. If the patient needs to receive care, you may be asked to wait before entering the patient’s room. No visitors 12 years old or younger are allowed in the Neuro ICU or the Neuro ICU waiting room. Only two visitors per patient may stay in the waiting room overnight. You may obtain an overnight pass from the charge nurse after 8 p.m.
Real flowers are not allowed in the Neuro ICU rooms for infection reasons. To reduce the spread of infection, please wash your hands or use hand sanitizer before entering the Neuro ICU. If you are not feeling well, you will be asked to avoid coming into the Neuro ICU. It is standard policy to ask every patient if her or she has advance directives (living will) and/or durable power of attorney. If so, please make staff aware of this as soon as possible, so that we can respect the patient's wishes.